Hiring an aerial photographer or videographer in the Houston TX area can be a little overwhelming, especially if you’ve been tasked with hiring one…and haven’t done so before. Like hiring any professional service company, you’ll want to ask a series of questions to help insure that they’re the right fit for you and your project. Below are a few helpful questions you might want to ask. What kind of experience do you have and does it match the services I need? Different aerial photographers and videographers posses different skillsets, experience and technology to complete different projects. Make sure you look for and find a photographer who best matches the specific needs of your project. Is your company or your pilots certified and insured? 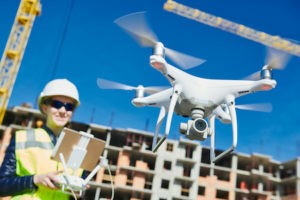 Managing risk and limiting liability is important, especially as many of our projects are commercial projects where we’re filming in and around buildings, parking lots, ranches with hundred of acres — and certainly the airspace all around these venues. All of our operators are insured and certified and all of our operators are compliant with the FAA and hold a current 333 exemption. Can we see examples of your work? You should always review their work. When clients ask us that question, we say, “absolutely.” Click here to see some examples of projects we’ve completed for other clients (you’ll see case studies, images and videos). If you’d like to see more examples of work from specific services, just ask us! Do you only use drones? Beware of the solo operators who got a drone for Christmas and think they’re in business. A true aerial photography business in Houston is exactly that — a business — and is set up to work with other businesses. Don’t be afraid to ask other questions like…”how long have you been in business, can I see your license, do you have referrals, etc.” Oh — to answer the question about only using drones! While we use drones to capture still images and video on many projects, we also utilize airplanes and helicopters when they’re required. Additionally, we work with many businesses who need to shoot studio images and video as part of an overall project and can facilitate this service as well. My boss expects to see reporting and documentation of the services you provide — we may need them for our clients or for governmental or legal reasons. We certainly understand and it’s our focus to ensure quality control throughout each project. We provide actionable, detailed reporting and documentation as needed by clients, many of whom are architects, engineers, construction companies, public adjusters and law firms. Hopefully these questions help — or help to spark other questions. If we can be of assistance on your next project, please let us know. We service the entire state of Texas and are just a phone call away.